It was a small matter that had quickly become a big one. The store is structured as a co-op, with approvals and discussion being necessary to get anything done. Here’s a good example from the co-op’s old days: a new sign was needed, so a designer was lined up, as was someone willing to paint it. The idea was presented to the co-op board, a consensus was reached, and the new sign was started… two years later. So, while the problem was solvable, the time it took to address it came up against the co-op’s often-precarious financial situation: with no money to go on, they were forced to announce, and not for he first time, that the store was closing. The People’s Co-op started with a fundraiser. In 1945, a group united by their dissatisfaction with the direction the world had taken put out a call to the activist networks they’d been a part of through the 1930s, groups that had organized sit-ins and protests in Vancouver during the Depression as part of a social movement that had been derailed by the start of the Second World War. Led, in part, by the Unitarian Minister Rev. Alfred Stiernotte, the co-op founders wanted to “stimulate the circulation of books that are socially significant,” as the store’s inaugural pamphlet said. Co-op shares sold for a dollar, and were bought up by a range of people who reflected the far reach that sort of pro-labour thinking had at the time. 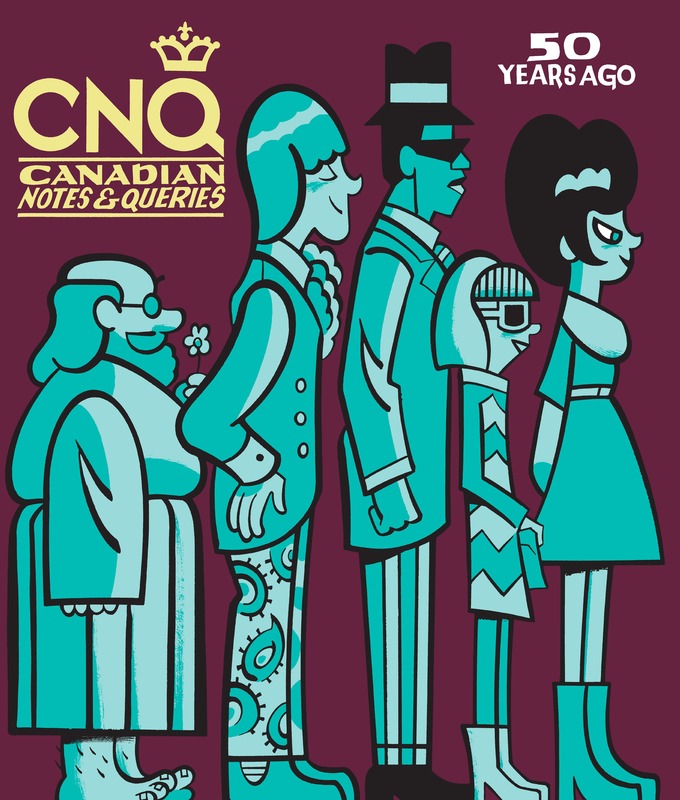 There were early NDPers and card-carrying communists, but also people from all walks of life “riveter, welder, machinist, seaman, housewife, trapper, trade union official, conductress, motorman,” long-time board member Betty Griffin told the Vancouver Courier in 1995. This high-minded call for advanced thinkers and progressive books soon drew the attention of the local RCMP, who were joining their US counterparts in monitoring any communist-adjacent activity in the 1950s. The police set up shop in a room above a bank across from the store’s new West Pender location, and conspicuously plain-clothed patrons started hanging around. “That sort of dampened the enthusiasm of some of the customers,” Griffin explained in 1995. Also dampened was Marks’s enthusiasm for communism; the Soviet invasion of Hungary in 1956 led him to abandon the cause in favour of employment at another Vancouver bookselling institution, Duthie Books. 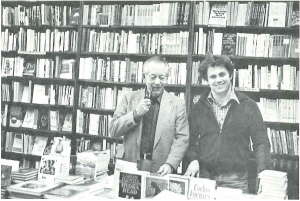 Past Co-op Chair Harold Griffin (left) and ex-manager Dan Keaton, 1982. 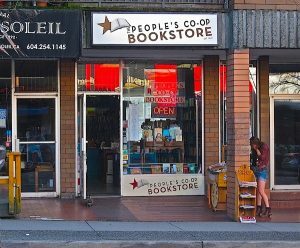 The People’s Co-op spent the next twenty years bouncing around various locations on West Pender’s 300 block while running initiatives that took the store far beyond downtown. They ran mail-order catalogue service for members all over BC and Washington state, kept up wholesale operations to supply other bookstores with hard-to-get left-leaning books. They had a bookmobile that toured the province, ran book fairs and stalls at local events, including the Pacific National Exhibition. The co-op’s presence at the latter went un-remarked on for years, but in 1968, possibly caught up in hippie backlash, they were told they were no longer welcome. A legal battle eventually vindicated the store and spoke to swinging public opinion on the co-op’s politics. This acceptance of left-leaning and communist philosophies began to hurt the store through the next decade. The co-op’s politics were seen as less radical; at the same time, a number of other shops opened with similar ideologies. The books once only available at the co-op could now be had anywhere. 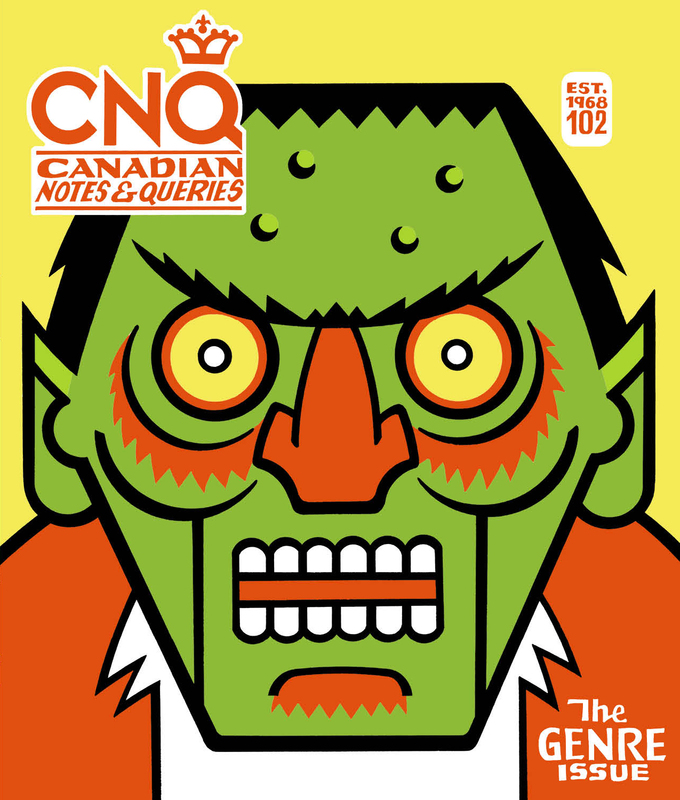 To broaden its appeal, the store expanded its focus on local authors, boasting one of the city’s better selections of Canadiana and Canadian authors. But having lost their distinct voice, the store was, by 1982, suffering from what Board Chairman Hal Griffin called “Insufficient initial capital investment.” A move to the then-cheap rent of Commercial Drive bought the store some time but wouldn’t have been enough to keep doors open had the store not fallen into an unexpected windfall. The co-op’s long-standing connection with Progress Publishers (the Soviet government’s publishing arm), led to the store being asked to run the Soviet Pavilion’s book stall during Expo 86. Selling everything from books to souvenir trinkets, the store found itself in the black for the first time in years by the time Expo ended. The Expo money should have been huge for the People’s Co-op—the lack of initial capital investment that had held the store back since its inception was no longer a problem; with money in the bank, all they needed to do was invest it in stock. Instead, in Maurer’s view, the co-op board “sort of lost their minds.” The board saw the excess funds as a license to run the store as it always had; the Expo windfall was built into the store’s budget to absorb losses. Funds began to dwindle through the nineties, but then were re-upped by the death of an old Communist Party stalwart who bequeathed the co-op a large sum. This happened twice more through the 2000s, but by 2009, the money was really running out. With no more windfalls forthcoming, management decided to close shop. KKK members protesting outside the shop, 1984, via SFU archives. It was at this point that Maurer’s regular involvement with the co-op began. He’d had previous dealings with the store as publisher of New Star Books, and as a volunteer in the nineties, but when the announcement of the store’s closing reached him he was curious as to why, with money in the bank, this should be so. Maurer details what followed in his excellent multi-part blog series, “My Careen as a Bookseller.” Here’s the short version: an old guard of co-op members and employees believed the store was unsaveable, using two decades of losses as justification; meanwhile, the new guard thought the bookstore could be saved if the money slated for retirement buyouts for the old management was instead used to buy new stock—they’d discovered the store did not actually stock enough books to turn a profit. The disagreement between sides led to a protracted stalemate. By the time it ended in 2011, the new guard had control of the store, but were left without any capital to invest, the account having been drained by two more years of losses. Faced, again, with a lack of capital to invest, the store had to get creative to survive. One of the board’s first moves was to bring in used stock via a book drive. Enough new titles were donated to keep the store afloat and attract more business; as Maurer says, “If you fill your bookstore with books, you’ll also fill your bookstore with people.” It’s an idea that may seem self-evident, but one that bookstores had been moving away from since the eighties. The old image of a bookstore—Binky Marks hidden somewhere among stacks of precariously leaning books—had given way to the more “organized” chain stores, where the bookseller relies on prominent (paid) displays, with general stock limited to evergreen bestsellers and immediate backlist. “We’ve gone backwards in book retailing,” Maurer says. From stores filled with books to a system that favours the chain model—where publishers and booksellers combine to try to tell customers what they want, rather than letting them find it for themselves. He compares the new system with the old Ontario beer-store system, where you walk into a room, write your order on a slip, and wait for it to be brought out to you; there’s an illusion of choice, but without the ability to really browse the stock, you end up just buying what you know. This, he believes, is changing. Maurer points to Waterstones, in the UK, switching to a box-chain indie model—where booksellers once again have control of what they buy for each store—as signs that booksellers are once again looking to variety and browsability. People’s Co-op membership application, 1980s. At the co-op, filling the store with books has worked out well. Used-stock sales provided the funds to reinvest in new stock. The store now carries about 90 percent used books and 10 percent new. The new stock brings in neighbourhood people looking for the latest bestsellers—the store bases its ordering very much around customer requests—and the used stock gives customer something to look at if they can’t find what they want. It’s also allowed a wider range of books into the store. While the People’s Co-op is still very clearly left-leaning, politically, it’s less communist-focused than it was in past years. There’s still a smattering of Progress Publishers books (likely leftover from Expo) and your usual Leninist/Marxist books, but there’s also a large section of out-of-print feminist books, philosophy, and literature. And the store continues to support local authors, carrying their books and hosting events. If anything, the co-op is returning to its roots: a shop filled ceiling-high with a wide range of socially significant books. That wide range of books brings with it a wide range of supporters, and it was these people who stepped up during the co-op’s most recent crisis. At the January SGM, once the problem was laid out, one of the members asked how bad the cash crunch was. Maurer gave the number, and then, as he recounts, “A couple of people looked at each other, they seemed to think, That doesn’t seem impossible. There was a moment of silence […] and one of our members got up and said, ‘I just got my property assessment, and in the last year I am 100k richer than I was a year ago, and I haven’t lifted a finger, so I pledge 10k to the co-op.’” Others quickly jumped in with their own pledges. After the meeting, word spread, and by the end of the next day, the co-op had enough funds to meet their immediate needs and put a cushion in the bank. The most heartening thing about the donations, to Maurer, was the type of people they were coming from. 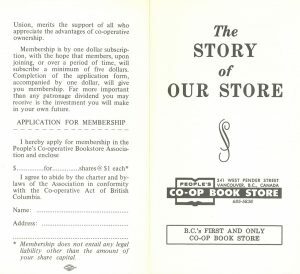 For decades before the new guard took over, the store had been mainly communist; now, however, donations were coming in from people whose diversity reflected that of first group of donors—UBC profs, professionals, trade unionists, and people who just liked having a bookstore in their neighbourhood. Hopefully that support will sustain the store for another seventy-five years.